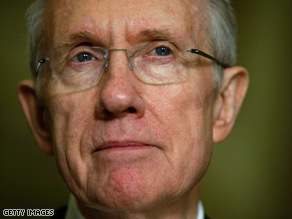 Harry Reid is caught in a tight race with Republican Senate hopeful Sharron Angle. Washington (CNN) – No fewer than five special interest groups have run television commercials in Nevada since June in an effort to try and influence a small group of voters who will decide whether Senate Majority Leader Harry Reid wins a fifth term. The groups, four pro-Republican and one pro-Democrat, have spent at least $2.8 million on TV ads since Tea Party favorite Sharron Angle won the GOP nomination at the beginning of the summer. Angle, herself, has spent more than $2.6 million on commercials, while Reid aired more than $1.9 million on TV ads in this same three month time period. Today, Reid put a new commercial on TV that is sharply critical of Angle. In total, nearly $7.5 million worth of television commercials for this Senate contest have aired since June, according to an analysis by Campaign Media Analysis Group for CNN. And that number is expected to double by Election Day. The pro-Democratic group, Patriot Majority, has spent more than $1.6 million on pro-Reid commercials. American Crossroads and Crossroads Grassroots Policy Strategies, two groups affiliated with Karl Rove and Ed Gillespie, are responsible for the bulk of the pro-Republican spending in this race. American Crossroads has aired a little more than $622,000 worth of ads, while Crossroads Grassroots Policy Strategies has spent about $416,000 on commercials. Another national GOP group, Citizens United, has run more than $60,000 worth of TV ads and Las Vegas-based Americans for New Leadership spent about $38,000 on commercials. Republicans are keying in on the Nevada race, and see it as an opportunity to defeat a vulnerable Reid, much like the GOP did in 2004 when it successfully unseated then-Senate Democratic Leader Tom Daschle. The difference in the 2004 South Dakota race is that Republicans fielded a battle tested former congressman in John Thune. In the 2010 Nevada race, Angle has made a series of missteps, yet she still has a very good shot of defeating Reid in what is shaping up to be an anti-Washington, anti-incumbent political year. “A really small part of the electorate is undecided, between 5 percent and 8 percent,” said Jon Ralston, the well-respected Nevada political analyst. The most recent Mason-Dixon poll showed that Reid holds a 1 percent lead over Angle, well within the survey’s 4 percent sampling error. And that poll noted that 5 percent of respondents remain undecided in the Senate contest. The number of TV ads for this Senate race is only going to increase as we inch closer to Election Day. I was watching those who didn't have anything better to do than listen to that lunatic angle. Most seemed to be the same people she is going against. Social Security recipients for starters. Go watch One Flew Over the Cucko's Nest and tell me she shouldn't be in an institution. That the voting is that close tells you how dumb and stupid people get when living in the desert. It has to be the heat if what this woman has said and posted in her website then retracted because it was "the wrong thing to say/" Like calling herself a mainstream moderate!! She is a teabagger. Nothing moderate or sane about them.